This is the village Coat of Arms. This was designed by resident Paul Priestman following a period of research. Roses are part of the Coats of Arms of both the families of Ayton of Ayton and Home of Ayton. 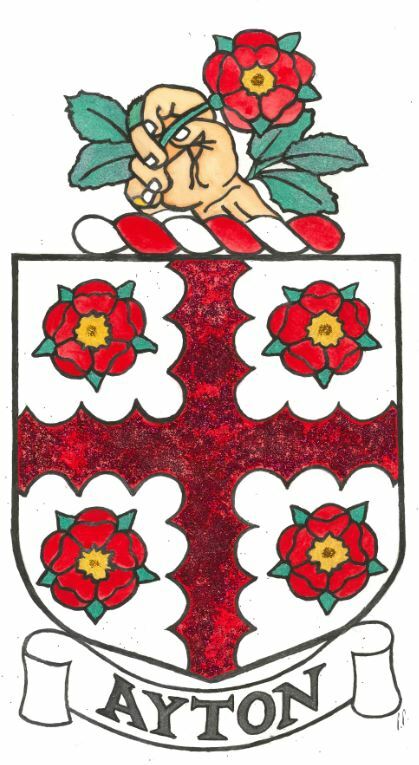 The hand grasping a plucked rose is loosely based on the crest in the Coat of Arms of the ancient family of Ayton which settled in the area in the 12th Century and resided here until the latter part of the 15th. It is thought that the rose was taken from the Arms of the old Earls of Dunbar, of whom the Aytons, like other Berwickshire families, were supporters. The Latin motto from the Coat of Arms, Derceptae Dabunt Odorem referring to the pulling of the rose, translates as, “Even plucked they give out scent”.